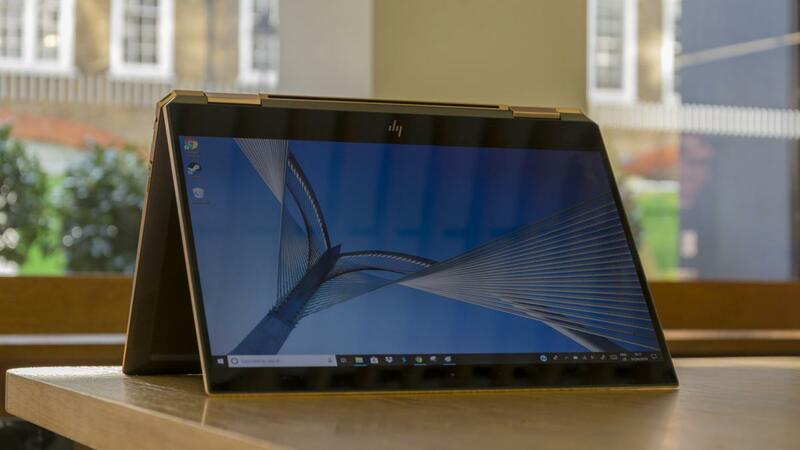 HP Spectre x360 13 (2019) review: The cutting edge of 2-in-1 laptops? The Spectre x360 has undergone a makeover, inside and out. But is it still leading the way for 2-in-1 laptops? The gap between 2-in-1 laptops and tablet-laptop hybrids is steadily closing. Devices such as the 12.9in Apple iPad Pro and Microsoft Surface Pro 6 may signify that the tablet hybrid will soon become the preferred form factor. 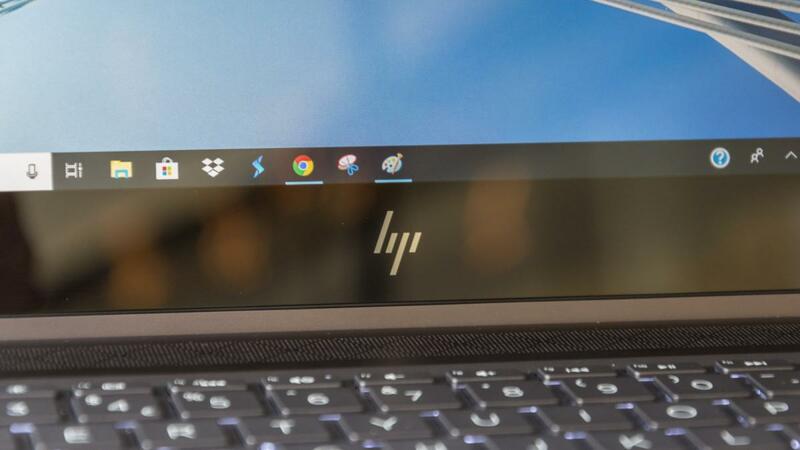 But with the new Spectre x360 13, HP is doing all it can to make 2-in-1 laptops more desirable than ever. Since the first model launched in 2015, HP’s Spectre x360 line has been at the forefront of 2-in-1 laptop technology. In addition to the usual spec upgrades, this year’s Spectre x360 13 has undergone notable design changes as well. The HP Spectre x360 13 (2019) is a premium consumer laptop with a 13.3in touch-enabled display and a 360-degree rotating hinge. As you’d expect, it’s technologically superior to all the Spectre x360 models that have come before it. My review unit has a 1,920 x 1,080 (FHD) display resolution, an 8th-Gen Intel Core i7-8565U processor plus 8GB RAM and a 512GB PCIe SSD. 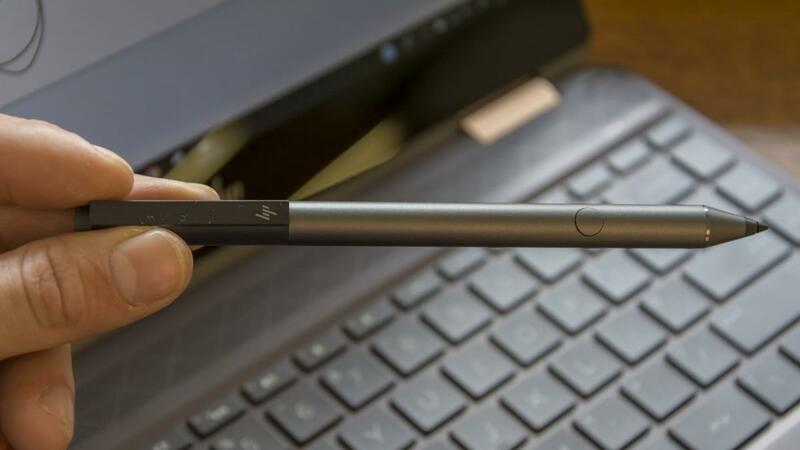 HP has even bundled in a rechargeable Active Pen stylus to sweeten the deal. More expensive 4K models of the HP Spectre x360 13 pack up to 16GB RAM and up to 1TB PCIe SSD. So how much do the different models cost, and what does the competition look like? 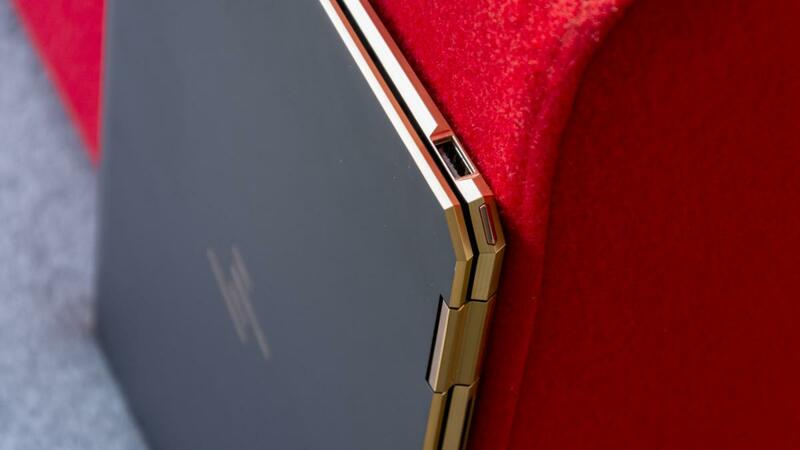 For the HP Spectre x360 13 (model number: 13-ap0001na) I’ve described above, you’ll have to stump up a hefty £1,400. That’s no joke, and the base spec model isn’t all that much cheaper at £1,200. Now for £1,300, you could get the newly-released Lenovo Yoga C930, a gorgeous 2-in-1 that has a Dolby Atmos soundbar built into its rotating hinge. Despite its lower-spec Intel Core i5-8250U processor it actually outdoes the Spectre x360 13 in certain performance benchmarks. Then there’s the Razer Blade Stealth 13, which costs £1,500 and has the same Intel Core i7-8565U chipset as my Spectre x360 13 model. Crucially, that price includes dedicated Nvidia GeForce MX150 graphics. The Blade Stealth 13 isn’t a 2-in-1, however, which rules it out if you’re after a touchscreen laptop. Seeking the most powerful HP Spectre x360 there is? You’ll have to go for a larger HP Spectre x360 15 (2019); the top-spec model costs £1,900 and has a 4K display, an Intel Core i7-8500H CPU plus dedicated Nvidia GeForce GTX 1050 graphics. The new Spectre x360 13 has an all-aluminium build with a similar aesthetic and colour scheme to the HP Spectre x360 (2018) that we reviewed last year. Overall dimensions and bezel sizes are about the same, too. It’s gained weight but only barely, up to 1.33kg from 1.29kg, and is marginally thicker at 14.7mm over last year’s 13.6mm. But then much of the minimal extra bulk is offset by the angular ‘gem cut’ rear edges. Beyond looking a bit strange, the sliced off edges serve a practical purpose. The back right corner now has a USB Type-C (Thunderbolt 3) charging port, while the power button is located in the back left corner. It took me longer than I’d care to admit to find the latter. The corner charging slot also helps to reduce cable clutter around the laptop, leaving that little bit more space to work. 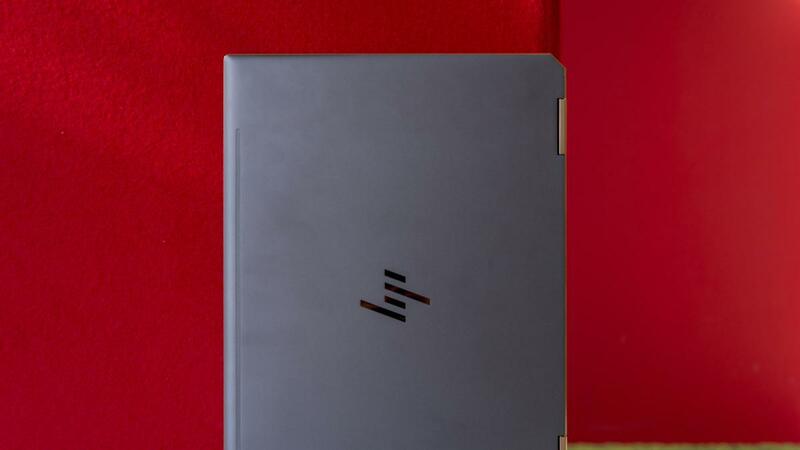 It’s a shame that HP hasn’t managed to fit many ports elsewhere on the Spectre x360 13’s edges, which are super slim and taper off to become even thinner towards the front. On the left edge is a lone USB Type-A slot, all the way at the back by the angled corner. Over at starboard, there’s a 3.5mm audio jack, microSD card reader and a second USB Type-C slot with Thunderbolt 3. A webcam killswitch is located here too. 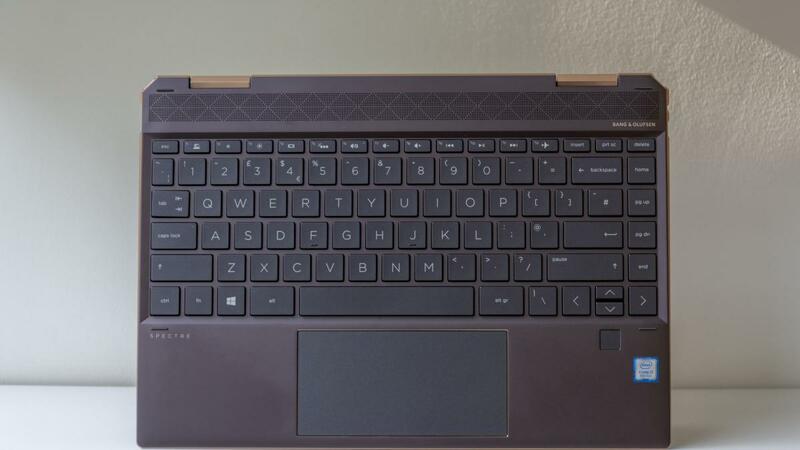 Compared to other laptops in this price range (like the Dell XPS 13 or Lenovo Yoga C930), the HP Spectre x360 13’s large bezels look out of date; it’s a diminutive display to begin with and the amount of dead space around the screen is especially noticeable when the laptop is in tablet mode. Beneath the screen is a pair of Bang & Olufsen speakers, and they are supported by another pair of down-firing speakers – also B & O – on the laptop’s underside. They’ve got some oomph in terms of sheer volume but lack that rumbling bass essential for hip-hop tracks and movie explosions. Dialogue comes through loud and clear, making the speakers well suited to watching YouTube videos and listening to podcasts. But when the Bang & Olufsens are overloaded with fast-paced rock from the likes of Motörhead the audio gets muddled. Once the laptop is folded up into tent or tablet mode the speakers also face away from the user, reducing their impact. 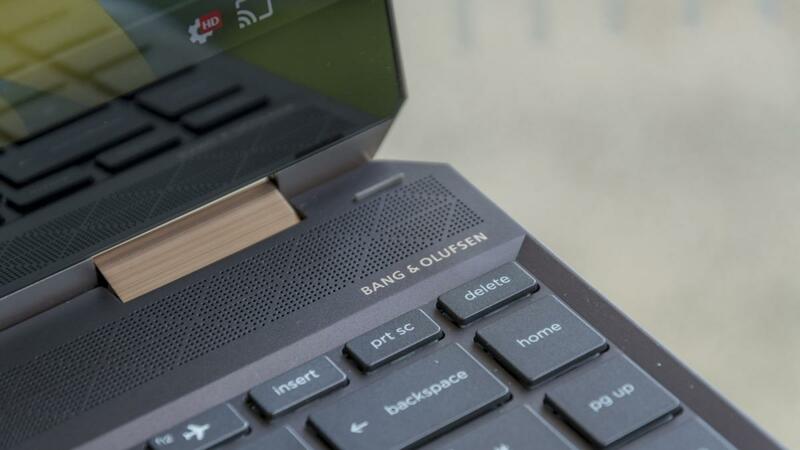 Folding the laptop couldn’t be easier as the hinge is nice and smooth and it’s reasonably stable, not sliding along surfaces as you tap the screen. 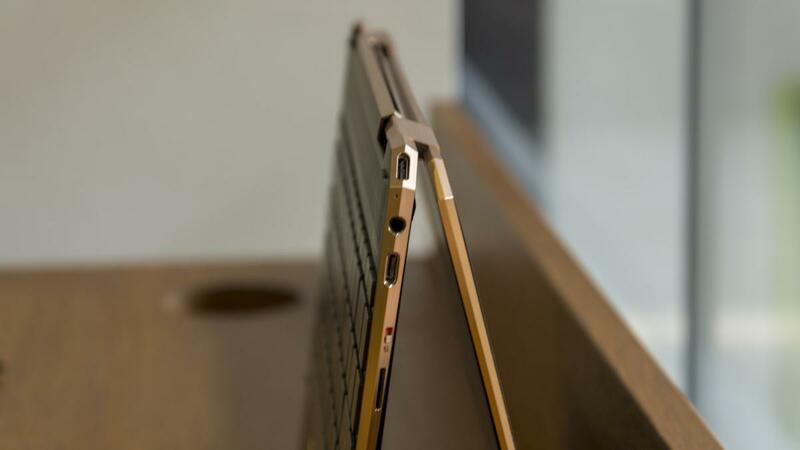 The hinge is less sturdy in regular laptop mode, though, wobbling a tad with each touch of a finger or stylus. The touchscreen itself is reliable and responsive, with a slick layer of Corning Gorilla Glass NBT that reduces friction and prevents smudging. I’ve no complaints about the bundled HP Active Pen stylus, either. For starters, it’s free of charge, which is an absolute blessing when Microsoft and Apple want £100 or more for separately sold styluses. The Active Pen is about the size of a fountain pen and made mostly of metal apart from the plastic twisting cap at the top, which slides upwards to reveal a USB Type-C charging port. There’s no stylus slot or magnet on the HP Spectre x360 13, unfortunately, so you cannot dock the Active Pen when it’s not in use. 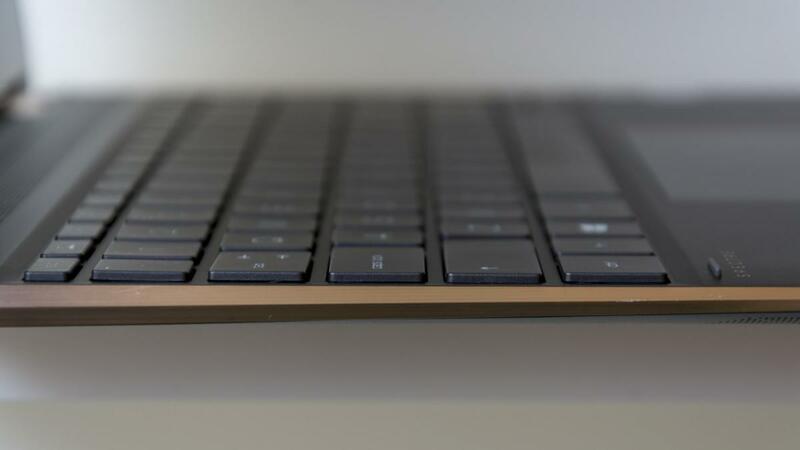 The Spectre x360 13’s chiclet keyboard is about as conventional as can be. Keys have a nice amount of travel and feedback and there’s a study click-clack to individual presses. The LED backlighting is controlled by the F5 key, with two levels of brightness. Beneath the keyboard is a fingerprint sensor that, in theory, should unlock the laptop instantly. Based on my two weeks of use it’s unreliable as I had to reset my fingerprint ID twice. I had trouble with the diving board touchpad too, which is more of a deal breaker. It’s a smooth, wide rectangular panel that gives plenty of freedom for moving the cursor around, but it has sensitivity issues. Palm-rejection barely works, for example, even with the touchpad reduced to its lowest sensitivity setting. The physical left and right clickers at the base of the touchpad work perfectly fine but tapping the touchpad to execute a click command often sends the cursor jumping off in a random direction. Conversely, it sometimes refuses to move from a fixed point when you attempt to click elsewhere. The more accurate you’re trying to be with the tap-to-click function, the harder it is to control it. My review model’s 13.3in IPS touch display has a resolution of 1,920 x 1,080 although, as mentioned earlier, 4K versions are available. The display’s quality is solid, its main issue being a relatively low maximum luminance of 292.9cd/m2. The panel is also reflective, which can compound the lack of brightness if lighting conditions are too overbearing. The HP Spectre x360 13’s panel has an sRGB gamut coverage of 89.2%, which is decent, but it falls short in terms of colour accuracy. While the majority of colours are spot on, certain colours are really undersaturated – dark blues, purples, pinks and yellows are all off. The average Delta E of 2.72 shows that colour accuracy overall isn’t too bad and most would struggle to spot anything amiss with the naked eye, but for colour-critical design work, it’s an issue. Otherwise, a 1334:1 contrast ratio creates sufficient contrast between light and dark, and Full HD video content is definitely vivid enough. 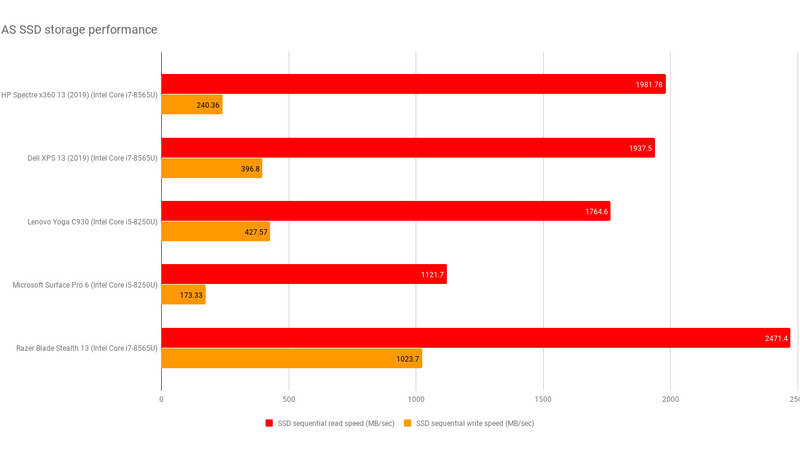 The CPU performance of the HP Spectre x360 13 is better than the model we tested last year but doesn’t reach the bar set by other laptops with the same chipset. Both the Dell XPS 13 (2019) and the Razer Blade Stealth 13 run on an Intel Core i7-8565U and have superior benchmark results. 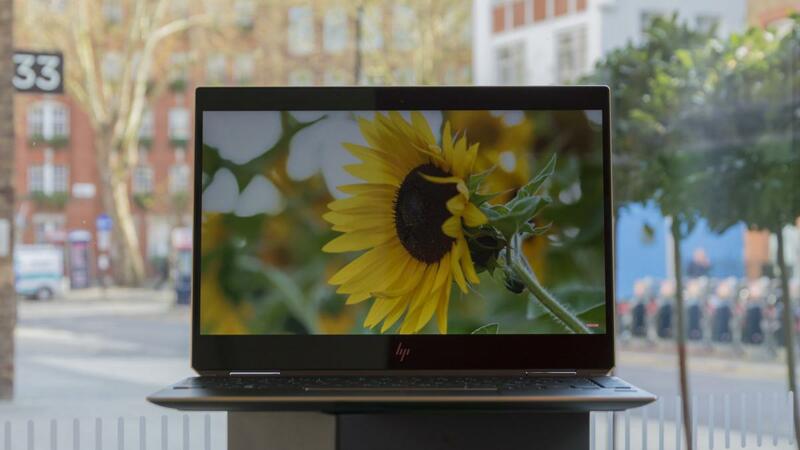 In our 4K Media test, which measures a laptop’s proficiency at image editing, video editing and multi-tasking, the HP Spectre x360 13 achieved an overall score of 78. 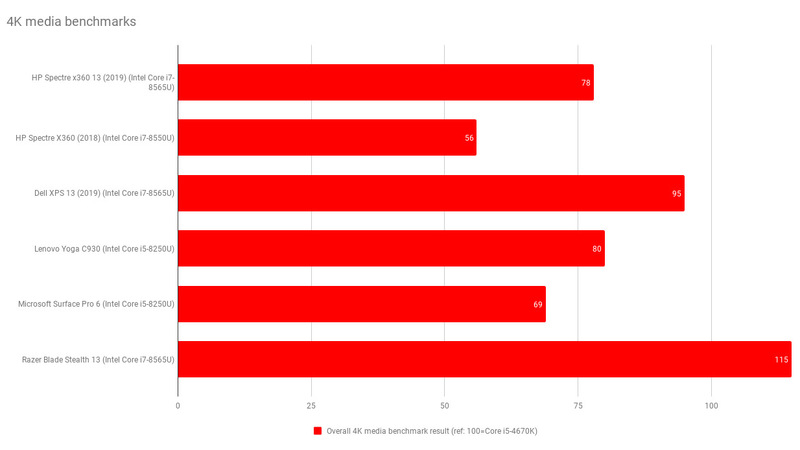 In the exact same test the Dell XPS 13 scored 95 and the Razer Blade Stealth 13 managed a super-speedy 115. Even the Lenovo Yoga C930, which runs on a lesser Intel Core i5-8250U, managed a score of 80 in the same conditions. What could be the culprit, then? I suspected poor internal heat management and running the 4K Media test while using CoreTemp software confirmed this. Each of the CPU’s four cores hit a maximum temperature of 100 degrees Celsius while the benchmark was underway. 100 degrees happens to be the processor’s safety limit; after that, it’s forced to dial back performance in order to cool down and reach safe levels. Externally it doesn’t get too hot, and even when the CPU is working overtime the keyboard area is still comfortable to use. The underside of the base gets warmer (50 degrees Celsius, in some places) when the laptop is running a demanding application. Let’s just say that you won’t want it on your lap for long while it’s working that hard. The Spectre x360 13 held its own in the AS SSD benchmark, with the 512GB PCIe SSD clocking sequential file read speeds of 1,981.78 MB/s and writing sequential files at 240.36 MB/s. As shown by the chart above this is about average based on the performance of rivals. Only the Razer Blade Stealth 13 stands out as having a significant edge. I wouldn’t recommend the HP Spectre x360 13 for gaming purposes since it only has integrated Intel UHD 620 graphics; it’s no match for the Razer Blade Stealth 13. 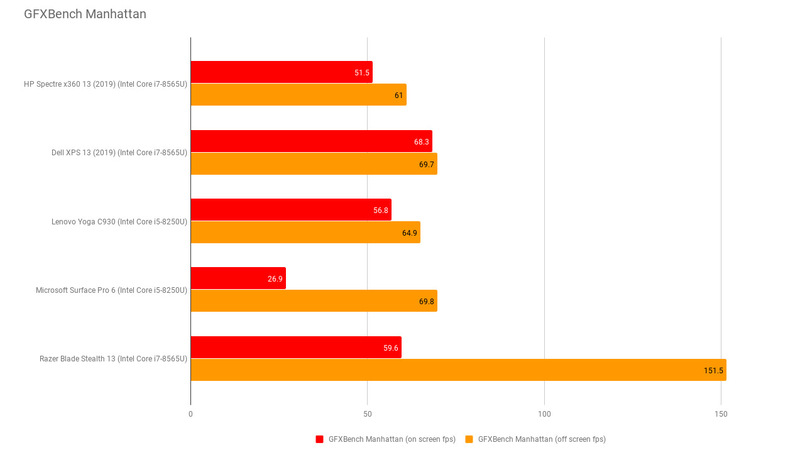 In the GFXBench Manhattan on-screen benchmark, the Spectre x360 13 maintained an average frame rate of 51.5fps to the Stealth 13’s 59.6fps. That doesn’t seem much of a difference until you look at the results for the off-screen test, which is a much better measure of a laptop’s gaming muscle; the Spectre x360 13 scored an average of 61fps while the Razer Blade Stealth 13 cranked out 151.5fps. If you choose to game on the HP Spectre x360 13 you should stick to less demanding titles (Minecraft, and the like). Play anything heavier than that and you’ll need to lower the settings in order to achieve a playable frame rate. In the 720p DiRT Showdown benchmark, for instance, the Spectre x360 13 managed an average of 36.82fps – hardly sensational, but just about playable. I’d be interested to see how a top-spec HP Spectre x360 15 with Nvidia GeForce GTX 1050 graphics handles games, although the added power would tear through battery life, which isn’t all that great on this lower spec 13in model. 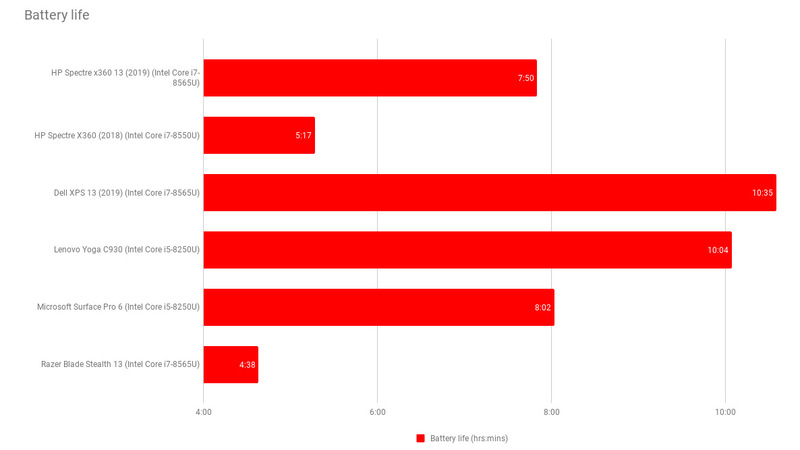 You see, apart from the Razer Blade Stealth 13, which has to power a dedicated GPU, the Spectre x360 has a shorter battery life than its rivals, lasting 7hrs 50mins in our battery rundown test. The Lenovo Yoga C930 went for 10hrs 4mins, the Dell XPS 13 made it 10hrs 35mins, and even the Microsoft Surface Pro 6 just pipped it at 8hrs 2mins. Clearly, you’ll have to recharge the HP Spectre x360 13 at least once during the working day – especially if you want to have enough juice for watching Netflix on a long commute home. In many respects, the HP Spectre x360 13 is an all-around improvement on the equivalent model we tested last year, but it still feels outdated in 2019. Blame the hefty bezels or the flawed touchpad, but performance is the biggest cause for concern; despite an Intel Core i7-8565U chipset it fails to better certain laptops that carry weaker Intel Core i5 chips. This lack of power stems from poor heat management, capping the CPU before it reaches its full potential. It’s not all bad news for the HP Spectre x360 13. The 13.3in FHD touch display is nice enough, the Bang & Olufsen quad speakers put out decent audio and the inclusion of a free (and good) stylus all help to make it a competent 2-in-1. You can’t ignore the stunning design of the laptop as a whole, either. But this isn’t some mid-range device for which you’re prepared to make excuses – it’s a £1,400 luxury laptop. And, for that money, you can do better in 2019.